n the market for a new pair of nursing shoes? Let us introduce you to Nurse Mates shoes — some of the most comfy and practical nursing shoes on the market! As medical professionals, we put our feet and legs through the ringer on a day-to-day basis, and study after study confirms importance of a high-quality pair of shoes; picking a good pair could mean reduced joint loading and less risk for developing arthritis and other rheumatic diseases. Indeed, a solid pair of shoes is always a smart investment, especially for nurses. A favorite among nurses everywhere, Nurse Mates is known for its production of high-quality, handmade nursing shoes that don’t sacrifice on style. At allheart, we love Nurse Mates because they have such a versatile collection of medical shoes that check off all your boxes. When you’re searching for a good pair, you need styles that are appropriately supportive, seriously stylish and up to your facility’s dress code. Nurse Mates shoes answer the call. Not only do they manufacture high-quality, slip-resistant nursing clogs, Nurse Mates also makes some pretty trendy nursing sneakers, lace-up shoes and slip-ons. If you love the understated, trendy style of low-top sneakers but require easy on, easy off, then you’ll definitely want to check out the cute nursing slip-on sneakers offered by this brand. The best part is, these slip-ons come in tons of unique colors and patterns, so they’re perfect for pairing with all your favorite scrubs. Nurse Mates Clogs and Shoes: Are They Worth It? 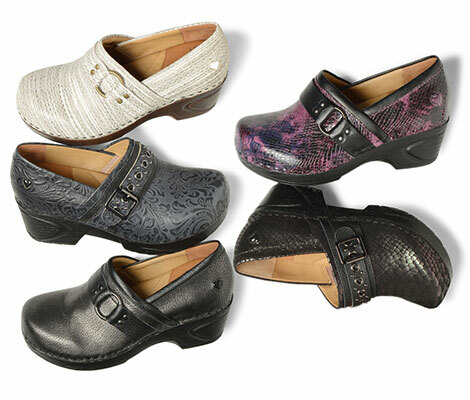 Despite this brand’s great variety of nursing shoe styles, Nurse Mates clogs are still some of the most popular. Each pair of nursing clogs by Nurse Mates is crafted from full-grain, stain-resistant leather or other durable material, proving that a pair of nursing clogs can be tough enough for your busy, demanding workplace. These clogs feature a shock-absorbing EVA bottom and Nurse Mates’ unique dual-density comfort footbed plus an Aerogrip slip-resistant outsole, so they’re easy to integrate into your facility’s dress code. These high-quality features extend to many other shoes by Nurse Mates, whether you’re looking for super-cute nursing Mary-Janes or sporty, lace-up sneakers. The brand makes versatile and good looking nursing shoes for men and women. Prefer a more classic nursing shoe? Nurse Mates is a good brand for that, too. It doesn’t get more classic than the Nurse Mates Pennie Nursing Shoe! 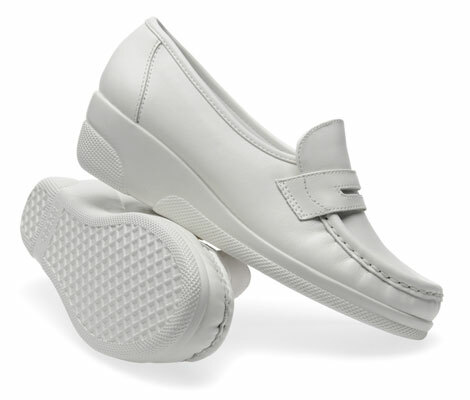 These all-white, leather nursing shoes have a hand-sewn construction and a loafer-style strap that harkens back to traditional nursing shoes. All pairs of shoes by this cutting-edge medical shoe brand can be ordered in various widths and sizes, so you know that you’ll get a tailor-made fit no matter what. Comfort - Nurse Mates have various different types of footbeds, such as the Pillowtop™ comfort footbed, a dual-density comfort footbed or a corrective orthotic insole. Most styles are ultra-lightweight and flexible. Safety - All Nurse Mates shoes have slip-resistant soles, and some feature unique insoles that help reduce instability, hip and knee pain, posture and back problems and more. Many also have flexible goring or stretch gore laces for a more precise fit. Sensibility - Each pair is made with a reasonable heel height, from 1.5 inches to 2.25 inches, and some feature stain-resistant materials and moisture-wicking lining. We’re willing to bet that if you’re a lifelong medical pro — whether you’re an on-your-toes nurse or a surgeon who’s constantly running around your floor — you already know the importance of nursing compression socks. These compression garments are designed to help improve blood flow and circulation, keeping you in great shape while standing all day. If you’re searching for some cute and quality nursing compression garments, we have to recommend Nurse Mates compression socks. These socks are made from a graduated compression material and extend through the calf, so they provide you with plenty of coverage beneath your scrub pants. But the reason why we love Nurse Mates compression socks so much is because they come in so many unique styles… who doesn’t want a pair of striped, polka-dotted and patterned compression socks for every single occasion? Make sure to check out our entire selection of Nurse Mates shoes and products to find an excellent selection of premium-quality nurse apparel by this great company!